AdRoll announced a corporate restructuring on Tuesday, debuting a new division that is solely focused on the business needs of B2B marketers. AdRoll is spinning off its B2B business into the new division, which is called RollWorks. The platform helps B2B marketers identify potential clients, reach the correct people within those targeted accounts, and develop a relationship with prospective clients via meaningful interactions. The new B2B-focused platform seeks to tap into an almost $5 billion market opportunity. The B2B digital ad market is predicted to grow 13% year-over-year to $4.60 billion in ad spend in 2018, according to a recent eMarketer study. Whereas RollWorks will specialize in B2B engagement, AdRoll will instead focus its platform to provide digital advertising assistance to commerce businesses. RollWorks and AdRoll will be run by parent company AdRoll Group, a newly announced company that will house the technology and innovation powering both RollWorks and AdRoll. AdRoll’s retargeting solution for email marketers, AdRoll Email, will be housed under the umbrella of AdRoll. The email solution sends personalized email messages, such as product recommendations, unique promotions, or shopping cart reminders, based on subscribers’ online behavior. With the corporate restructuring come several leadership changes. Tony Gabriner, the former Adap.tv CEO who joined AdRoll as its new CEO in April of last year, will transition to AdRoll Group CEO and RollWorks President. Scott Gifis, the vice president and managing director of AdRoll North America, will now serve as AdRoll president, while Aaron Bell -- the co-founder and CPO of AdRoll -- will lead the product development and innovation team for AdRoll Group. 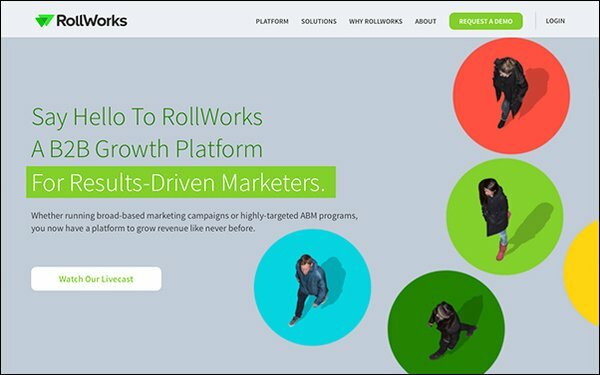 Customers who previously used AdRoll’s ABM platform have already begun to migrate to the RollWorks platform, which is now generally available for all customers in the United States.